The Grateful Dead: rock Legends, marketing pioneers. The Grateful Dead broke almost every rule in the music industry book. They encouraged their fans to record shows and trade tapes; they built a mailing list and sold concert tickets directly to fans; and they built their business model on live concerts, not album sales. By cultivating a dedicated, active community, collaborating with their audience to co-create the Deadhead lifestyle, and giving away “freemium” content, the Dead pioneered many social media and inbound marketing concepts successfully used by businesses across all industries today. 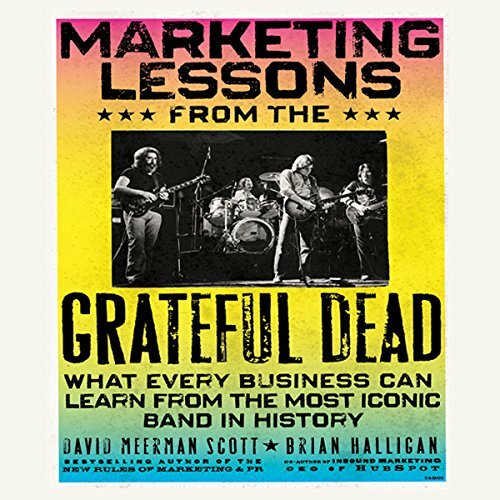 Written by marketing gurus and lifelong Deadheads David Meerman Scott and Brian Halligan, Marketing Lessons from the Grateful Dead gives you key innovations from the Dead’s approach you can apply to your business. Find out how to make your fans equal partners in your journey, “lose control” to win, create passionate loyalty, and experience the kind of marketing gains that will not fade away! I suppose you could write a boring marketing book about the Grateful Dead--but this is not it. This a short, strange and dead-fully fun look into marketing done the grassroots style a la Jerry Garcia, Phil Lesh and company. The authors met through a shared interest in marketing and the realized they also shared a passion for the Dead. They had both logged a number of concerts and were confirmed Dead Heads. This shared passion added to their years in marketing led them to combine the two in this breezy yet informative book. The Dead were crowd sourcers and copyright mavericks and interactive marketing gurus long before anyone ever thought about those concepts. The authors break down what worked for the Dead and then show how other companies gave applied those tools and how any company or creative might apply them in the context of a fluid, always changing on- and off-line world. This is on my short list of must reads for any business owner, marketer, student, or executive who is not sure how to function, flourish and be comfortable in this new day of marketing and sales. Its ground breaking, common sense, plain English! Short, actionable chapters make it an easy read. Honest insight makes it memorable. I think I was expecting a Grateful Dead version of Chris Anderson's Free. Perhaps a professional voice actor is in order. Sounded too much like reading from a script.